Gila Monsters leave their hibernation in the spring and engage in foo gathering. They are known to eat eggs out of other vertebrates nests, rodents, baby birds, frogs and lizards, and other small mammals including squirrels and rabbits - sometimes whole! The Gila Monster does not drink any water. Therefore, its food must provide all its nutrients. store enough energy for the whole year! Gila Monsters do not have great eye sight, instead they use their sense of taste to track down prey. They follow the preys scent by simply flicking their forked tongue to grab scent particles left behind on the trail. 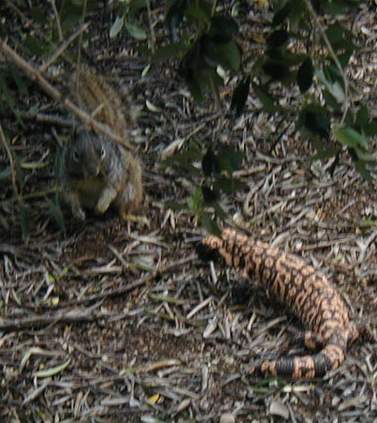 If the Gila Monster catches a recent scent, they will continue to follow the trail. 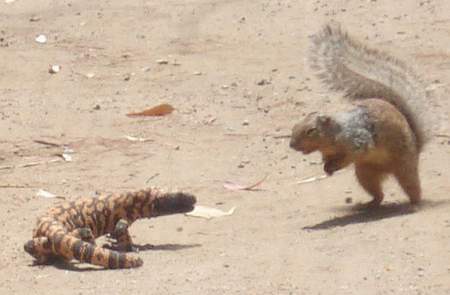 When the prey is within close distance, the Gila Monster will sneak close and attack. It will grab its prey and clamp down with its rounded teeth. The teeth on a Gila Monster are curved back for the ability to grip the prey. The Gila Monster remains clamped for minutes at a time to chew the venom into the open wounds. The venom of a Gila Monster is slowly oozed into the prey through the grooves located on the inside of the lower teeth. The venom usually hurts the prey by attacking their nervous system allowing the Gila Monster to eat the defenseless organism. Since the Gila Monster usually only eats in the spring, the intestinal track has to go through changes. The intestinal track goes through a state of fasting in the winter. When spring comes and the Gila Monster eats very large amounts of food at a time, the intestinal track has to change to a feeding and processing function. The saliva of the Gila Monster has a digestive enzyme called exendin-4. 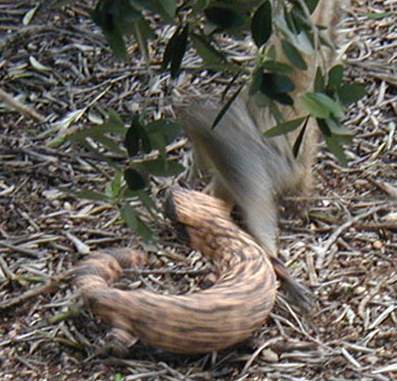 This helps slow the metabolic rates of the lizard and allows it to store the energy in its fatty tail. Gila Monsters are cold blooded and have a closed circulatory system.